BACKLASH vinyl graphics package, brand new from AutoMotorStripes! This is a side door stripe factory style Camaro body stripe for an OEM style application for the 2019 2020 Chevy Camaro SS or RS Camaro and fits the model year mentioned above. The decal sections included with this vehicle specific vinyl graphic are driver and passenger vinyl graphic stripes. Just choose the options needed from the drop down menu, including the premium cast vinyl grade. Add this needed exterior accessory to the new Camaro models for a real muscle car look and feel! Durable weather resistant vinyl will add years of enjoyment for a more custom factory style! Our "Premium Plus+" vinyl graphics used in the production of our accent striping, decal packages, and vehicle specific vinyl graphic line, can come with material in either 3M 1080 Wrap Series or Avery Supreme Wrap "ASW" Series vinyl. These materials offer wonderful conformability with superior UV protection, and have a manufacturers warranty. Please see the warranty page for more information. Both our Premium and Premium Plus+ cast vinyl materials are modern, high-tech, durable, and come with a patented, long term removable acrylic adhesive, with weather resistance manufactured into the vinyl. We do recommend following all manufacturers care tips to get the most life out of your new vinyl graphics kits, decal packages, and accent striping styles. 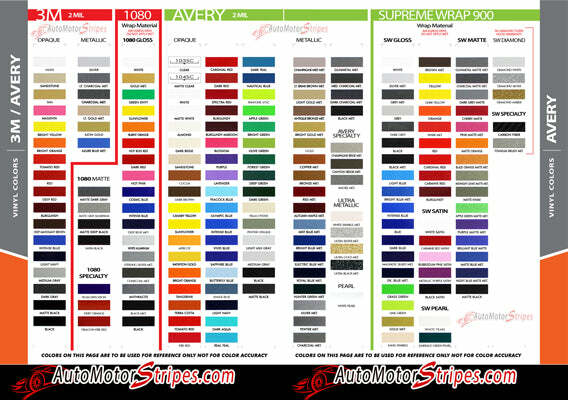 Please see more information on the 3M, Avery Dennison, and Ritrama websites, and also check out our AutoMotorStripes "how-to" installation links for more information. Now you can look like a professional by choosing only a professional grade "Premium" or "Premium Plus+" vinyl graphic film series!